← Blizzard in New England! Since I work on Valentine’s Day, my hubby and I are celebrating on my days off. On my first day off he gave me my present. He did a wonderful job! 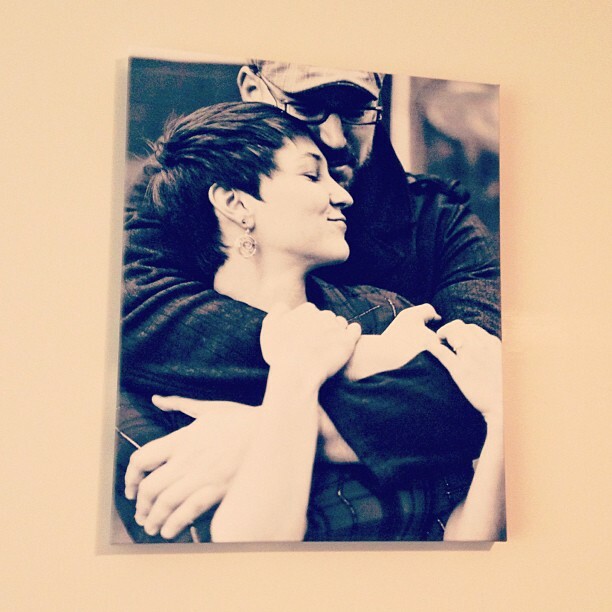 He picked his favorite photo from our engagement shoot, got it printed on canvas and, all by himself, put it on a frame that he built. I think that is my favorite part, that he put it together all by himself. 1) Buy dinner items and cook for your significant other. Believe me, you can get a lot better food, and a lot more food for a lot cheaper if you make it yourself. Everyone loves having dinner made for them! Spice it up with a fancy table cloth and a few candles from the dollar store, make your dining room look like a romantic restaurant! 2) Redbox/Netflix/Borrow a movie you both have wanted to see. Obvious date idea, true, but sometimes, if your life is like ours, time together is so hard to find, that when we watch a movie together, it’s a special thing. Going out to a movie is kind of pricy now a days, but if you make going to a movie the only Valentine’s Day event, you can still spend very little, and get to go out. You can make it a special event and dress up! Sure you may be the only couple in the theater in a gown and a suit but who cares? 3) So if it’s freezing where you live, and you like that, try a day of freezing cold sports! Skiing can be relatively inexpensive, especially if you already own equipment. Even if you don’t own equipment, you can look for the best deals at the ski slopes around you and probably spend $100. It seems like a lot, at least to me, but it can actually be cheaper to have a day of fun at the ski slopes, than to go out to dinner and a movie. Another inexpensive freezing sport, ice skating. Even with rental skates, a few fun hours of ice skating can be pretty cheap! 4) Are you a gaming family? Why not challenge your hubby to a long game of Mario Kart? Make a day of it! A tournament death match battle with your favorite vs. video games! If you have a Kinect or a Wii, you can even get active while competing! 5) Geocaching. It’s like hunting for really crappy treasure. This is an idea for those of you who aren’t buried under 7 feet of snow. The idea is to go around your house and find a bunch of silly little things you don’t mind giving up (bouncy balls, pencils etc). After you’ve combined a pile of stuff you don’t want, go to http://www.geocaching.com/ and find some coordinates near you. Type those coordinates into an available GPS or download a Geocaching App to help with finding a cache. Once you have your coordinates, use the GPS to find the little treasure box. When you find the box, take a piece of junk from it, and replace it with a piece of junk you brought. Ok, it sounds lame, but I swear it’s fun! Here’s hoping you have a wonderful Valentine’s Day with your special someone!